Once you have in mind what you want in your sail the next step is to select a sailmaker. The first thing to remember is like in everything else you do get what you pay for; don't let price become your overriding prerequisite. \ As a customer you should look at sailmaking as a service business, the relationship you have with your sailmaker will go a long ways towards insuring you get what you want. First look for a sailmaker that is in your local area or one that has a proven track record with the type of boat you have. You want someone you can talk to so they have a full understanding of what you want; the type of sailing you do and what you expect to get out of a new sail. Look for a loft that actually designs and builds the sails they are going to sell you. As odd as that may seem many ``Sail Lofts'' today are not much more than an office where someone takes your information and sends if off to a huge production facility somewhere overseas. This is important not only because you want to be sure of what you're getting but also because you want someone that is there to give you after purchase service. Spend some time talking with the actual sail designer about how you sail the boat, when you like to reef, what size headsail you are comfortable sailing with, anything that will help him design exactly the sail that fits your needs. Go over the type of hardware they will use on the sail and ask any questions you have about the use of it. Unless your boat is a one design class with strict rules on the sail sizes the sailmaker should go to your boat and take the actual dimensions from your rig. Even in popular well known classes there will be differences from boat to boat. How much mast rake you have, the type of furling system you have, the height of your furling drum above the deck, the height you want your boom to be above the cockpit are all things that change from boat to boat. He also needs to know the finish details for the sail such as the type of mast track and luff slides you need, the location of the reef blocks on the boom, offsets for the tack and clew pins, location of you sheet leads, and mast and spreader locations. And lastly make sure that part of the sale is their inspection of the sail on the boat after it is finished. A true offshore cruising sail should be built heavier than a local use sail and include much more reinforcement and chafe protection. When you are a thousand miles from a sailmaker you don't have the option of taking your sail in for small repairs, and in choosing the type of material you have to look at really long term durability; these sails can easily see more use in a year than most people put on their sails in ten years. Having a sail built with offshore construction is kind of like insurance, you're hoping it is something you never need but when you do you will certainly be glad you have it. The local cruising/recreational sail represent the biggest percent of the market. Generally these are sails that will be used on average less than 4 or 5 days per month and perhaps for a few long weekend cruises to local destinations. These sails are usually built of good grade Dacron fabrics and have a lifespan of between 10 and 15 years depending on how much they are actually used, and how much they are used in very windy conditions. Customers should be looking for sails that are easy to handle and built to have the desired longevity. The customer who enjoys the local recreational sailing but also wants to do a little racing will start looking at using fabrics and construction that are geared more towards racing, and adding in the features needed on the race course. The fabrics will be lower in stretch in order to hold in the more exact racing shape, which means firmer finishes, and have racing extras such as tapered battens, draft stripes, telltale windows, and maximum sizes according to the local racing rules. Racing sails are single purpose sails. They are built out of materials that have the lowest weight for their strength and stretch resistance and are constructed in methods that take the best advantage of the fabrics. 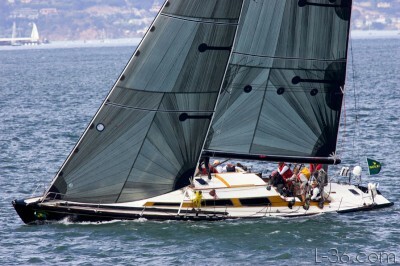 Longevity still has some bearing but generally only for boats that do longer offshore racing. Like all sails there is a range of materials and construction to choose from depending on the size of the boat, the conditions the sail is designed to be used in, the type of racing you do, and of course what your budget is. Racing a 35 foot boat in local club racing probably doesn't require the same level of sail performance that would be expected for trying to win a major world championship.